Two levels are in the books in the $365 PLO and the field is up to 66 entries, playing 75/150 now. 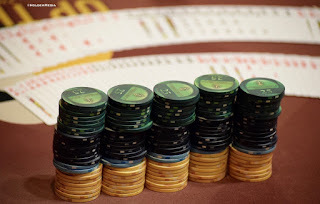 Around the corner the $365 8-Max is down to 31 players paying 12, action at 600/1200 with 200 antes. There is a $135 NHLE non-ring event at 7pm, registration open now, 6,000 stacks and 20-minute levels.